First things first can we comment on how beautiful these Spring blooms are! I am totally crushing on Spring right now. I was driving to a predetermined location for this shoot but when I drove pass this beautiful tree and cute white picket fence I fell in love an insisted this is where we do the shoot. I think the pics turned out beautiful! What do you think? As you all are aware I love leather so anything put together with leather I think is great, I loved this chambray top with the leather, it gives the look a little more edge (as my husband would say LOL) and I thought you could class it up with a few gold pieces. Both of these articles of clothing are a wardrobe staple. Both items can be purchased online the skirt is true to size and ON SALE! I got my top in a medium because I wanted it a little baggier, the xs would usually be the size I get and it is form fitting but I was feeling a little tomboyish so I got the baggier size. Thanks for stopping by have a lovely day! Thanks doll. I am happy you like it! This outfit is so edgy! 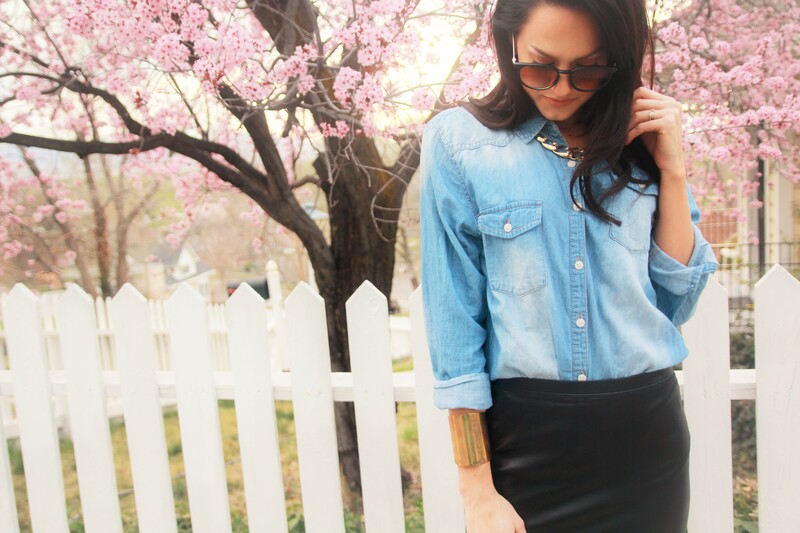 I love the jean shirt with this leather pencil skirt. I’ve been looking for a leather pencil skirt for ages, and this one is stunning! Thank you! I love it and it truly fits so well and it’s on sale! such a beautiful photos! love them and love the look too, especially that leather skirt! 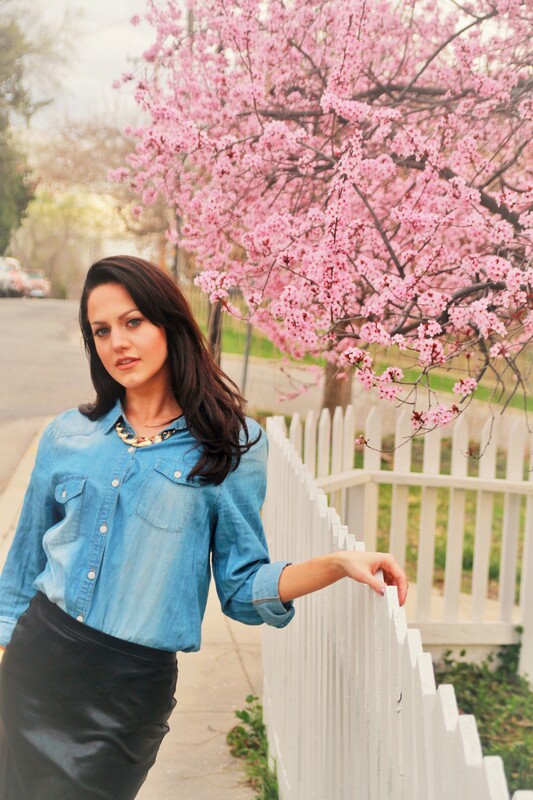 I love the outfit and the beautiful cherry tree in the background! Thank you so much, I know arent those blooms amazing!?! What a gorgeous look! You look absolutely beautiful, and the trees are stunning! 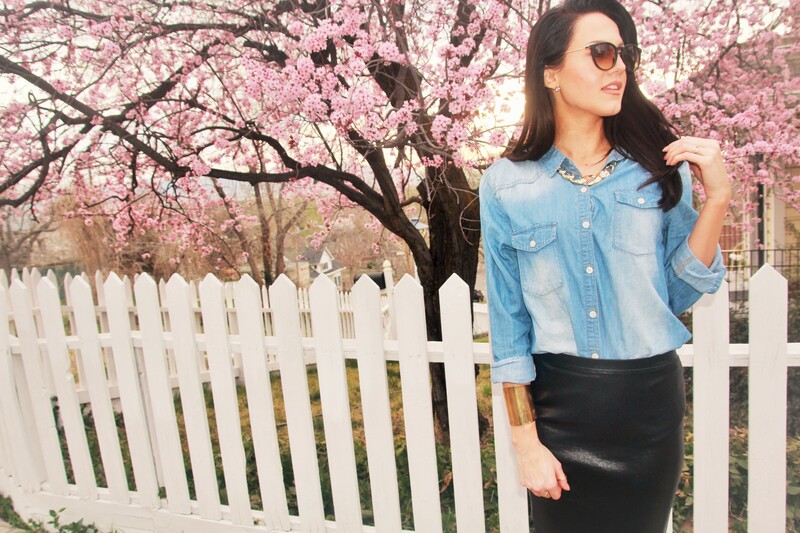 I love the chambray and leather mix, this is a great transitional piece going into Spring! Lovely photos!! Love your outfit. Looks so chic. Gorgeous shots. I am so excited spring is here. I love how you layered the necklace under the shirt collar. Very cool. Thanks hon! I know I’m stoked for warm weather! Haha I know anyone who is anyone must be wearing leather skirts haha thx doll! You are absolutely gorgeous! That denim shirt looks great, ever since I saw Jaclyn Hill wearing one I have been on the hunt for my perfect denim shirt. Also that tree is so beautiful!! Oh you are so sweet thank you. I know a good denim shirt is essential! Thx for stopping by! Super cute look I love the chambray and leather combo! I thought so too, I love the tree with the fence! Thanks babe! Another believable post! Girl, you know how to nail it. It looks like you are in heaven filled with blossoms! What a beauty! Love the outfit! beautiful pictures!!! love your style! Chic and edgy look. That leather skirt rocks! LOVE!!! This outfit is gorgeous!! You look amazing! This is such a cool outfit, I love the blossom trees too! Aww the cherry blossoms are in full bloom and you look beautiful! Love the leather pencil skirt! Thx hon it’s one of my favorites! Love the look, particularly the bootie! Thanks love, I love them too so comfy! Absolutely love the colors paired to together – and they look so lovely against that tree! I need one of those tree’s! I know right the tree is amazing! Gorgeous photos with the pink blossoms. I imagine the air scented with Spring. You look fantastic in that leather denim combo. So lovely. Thanks doll it was a beautiful site! Love the combo of chambray with leather and those beautiful backgrounds…we dont have such beautiful views here in delhi, India… wow! Thank you! Well I’m glad you got to see a little bit of my home town, can’t wait to see more of what you post from India! 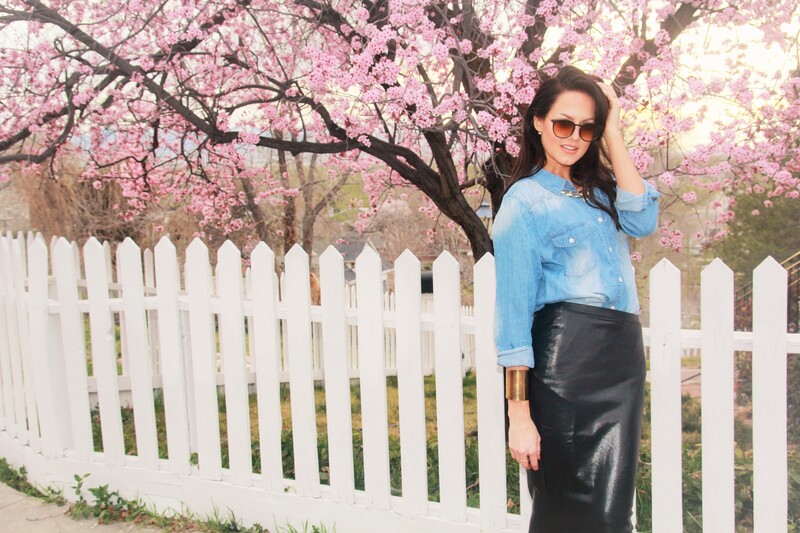 Love the way you paired this leather skirt with the denim top. Super chic but casual at the same time. You take such beautiful photos! YOU are absolutely stunning!! I’m such a fan of your blog, I really am! Thanks for being such an inspiration! Thank you Vanessa always so kind!